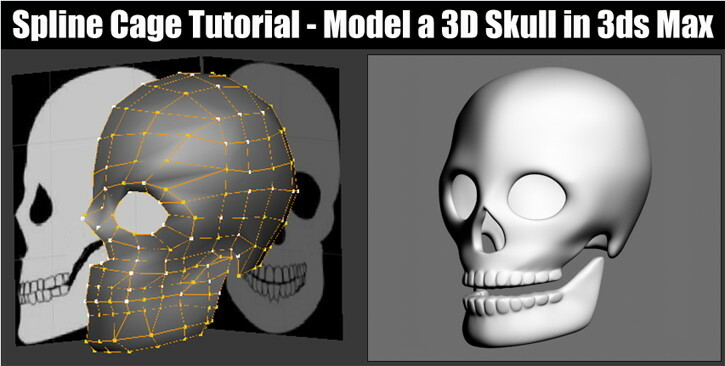 Modeling the human head / skull in 3ds Max is not that hard to do. 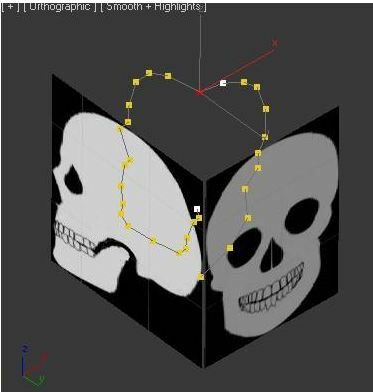 This tutorial will teach you the basics of Spline Cage modeling of a human skull using background pictures in 3ds Max. The process is the same for modeling a head. Draw a Spline using the Line tool. Make rough front and side outlines, and start building the Spline Cage using the Refine Connect tool. 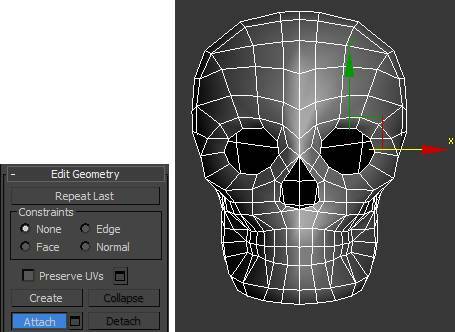 Then apply a Surface modifier to add skin to the skull. 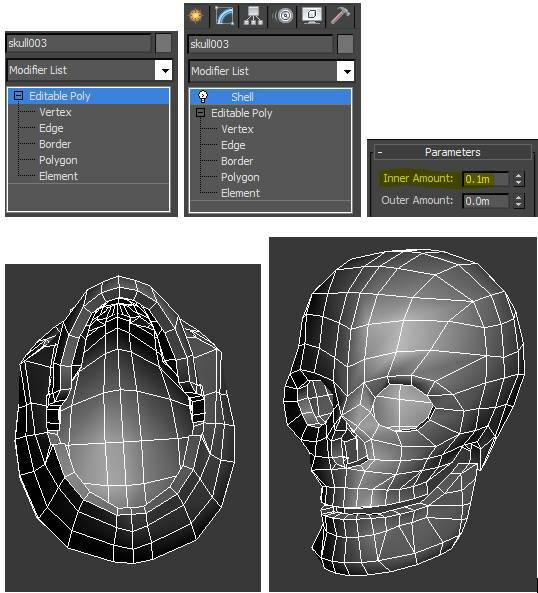 After the half mesh is complete, convert the object to an Editable Poly for further refining. Make a Clone Copy of the half mesh and Weld the two halves together to make one object. 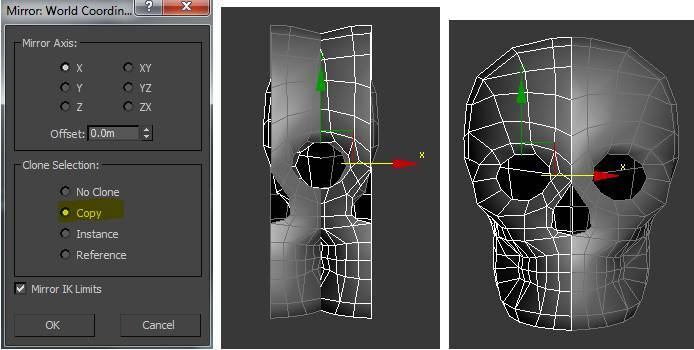 Add a Shell modifier to give inner thickness to the object. Finally, Extrude the teeth poly’s out a bit, and add a TurboSmooth modifier. Create a Plane object in the front and side viewports. Load the bitmaps into the Diffuse color slots. 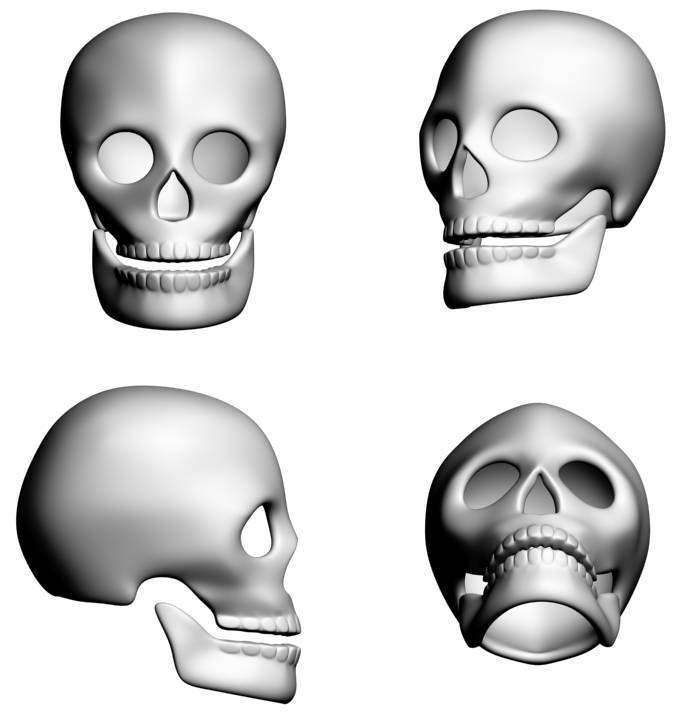 The skullfront bitmap is 176×239 pixels. Resize the frontPlane object so it has the right dimensions. The skullside bitmap is 224×238 pixels. Resize the sidePlane object so it has the right dimensions. This is what things should look like. 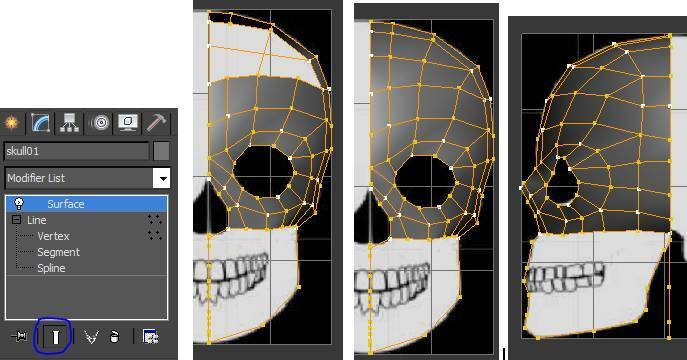 Go to the Line tool so we can make the rough outlines of the skull. Make a rough outline of the front of the skull. 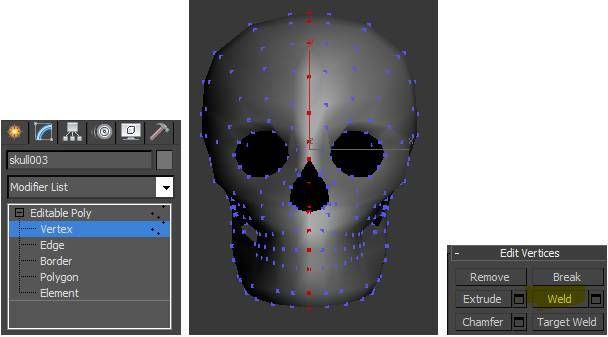 Then use Move to move the selection of points to the center of the skull in the Front viewport. Stay on the front viewport and start a new line by clicking Create Line. Make a rough outline. 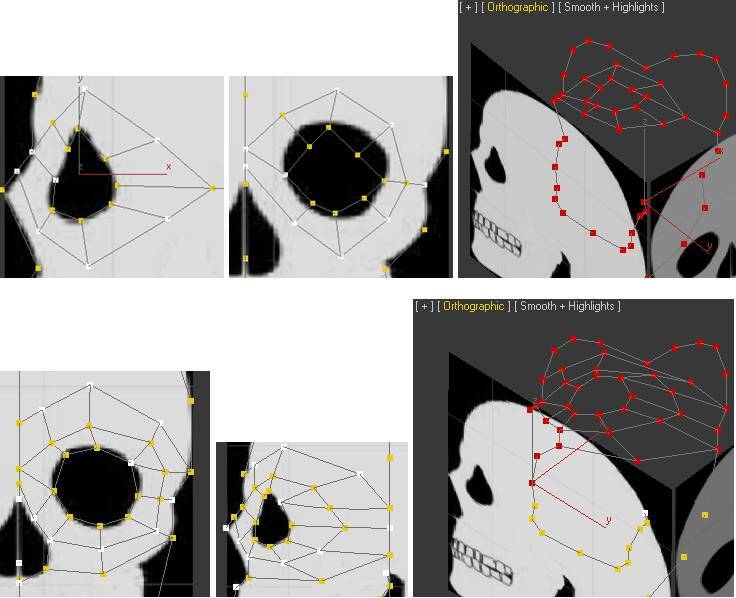 Then group select the new outline in the side viewport, and Move on the X axis to the middle of the skull. Go to Vertex mode. 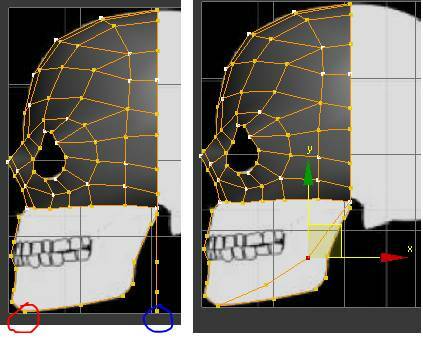 Fuse the two joining points at the top of the skull in the Orthographic viewport. Go to the Front viewport and Create Line. Make a rough outline of the eye. 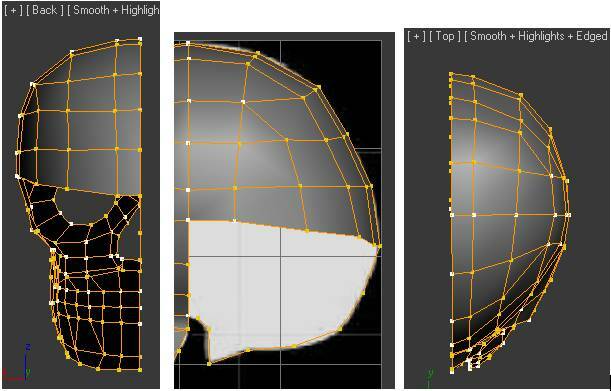 Then group select the new outline, and Move on the X axis to the middle of the eye socket in the side viewport. 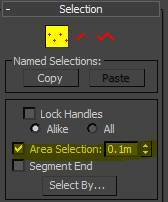 Checkmark the Area Selection at 0.1. This will allow you to move fused points without having to group select the points. Start shaping the eye in both side and front viewports. Use the Move tool for each point. Fuse any joining points. We will start using Refine with the Connect checked to create lines between points as we build the Spline Cage. Use Refine to add points on a line. 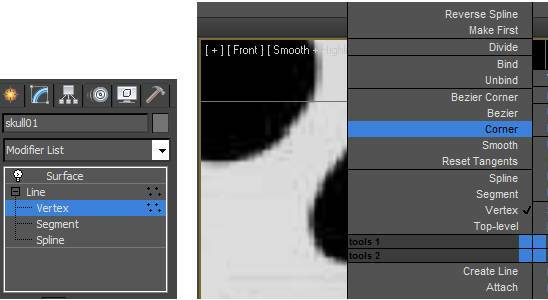 Each time you create new points, they might default to Smooth orBezier, withadjustable handles to create smooth curves. We just want a rough outline. So if any new points are curving the segments, then highlight all the new points and right click and choose Corner. 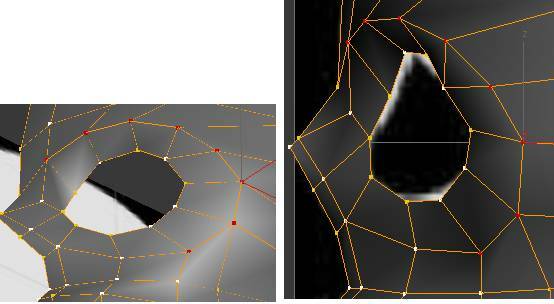 Start adding and shaping geometry to the eye area by using Refine Connect. You can now add a Surface modifier to see how the skin looks like on the mesh. Make the Steps = 0. Sometimes you have to adjust the parameters of the Surface Modifier. If the skin is inside out, then Flip Normals. The Threshold may give you problems. Start at zero, and increment very slowly until all the Quad/Tri mesh has a skin. Only Quad(four), or Tri(three) point connections will show up when applying the Surface modifier. In Vertex mode toggle the Show End Result button with the Surface modifier on, so you can edit the mesh and continue adding more geometry. Connect the point circled in blue, and Fuse it to the point circled in red. Then in the Front and Side viewports, move the points to make a curve. Start to work your way downward on the side view. 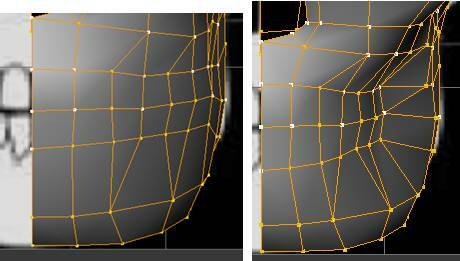 In the front and side views, start moving vertices to fill out the lower half of the face. Notice that the lines get tight at the edge of the face. Delete the points shown below. We will then stretch the mesh to match the side background. The front background picture is curved to much at the lower jaw bone, so we will use the side background picture as the reference. Delete some odd segments and Refine Connect to fix the mesh. Right click and go to Object Properties. Check See-Through. 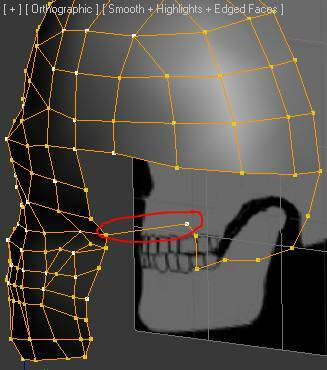 Add more geometry make a rough segment outline in the space of the jaw. 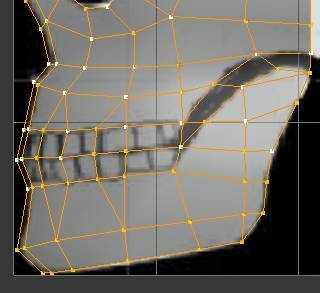 Also add more geometry for the teeth. Lets finish the back of the skull. Draw a rough outline in the side viewport with Create Line. Move it to the middle of the skull. Then Fuse the top points. Right click and Hide the Front viewport, so we can work on the back of the skull. 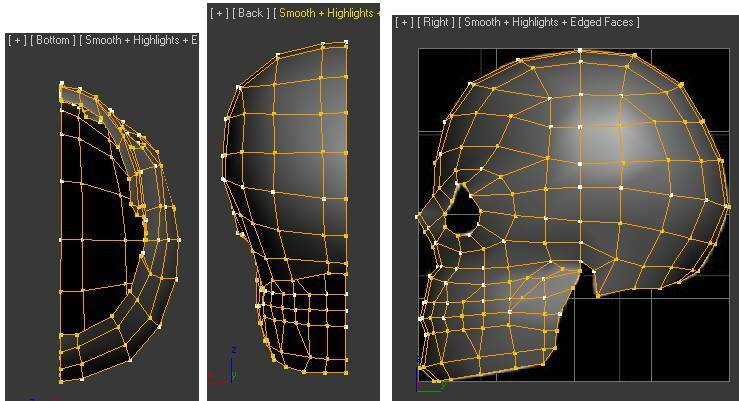 Start connecting points and adding new ones to shape the back of the skull, using the Side, Top, Back and Orthographic views as your reference. Check the back and side and top viewports, and adjust the points so the segments curve. Connect the two points below so we can start on the bottom of the skull. Start shaping the lower skull. Delete the left over points below. On the side viewport, pull down the points to match the background. Check all views and adjust the points. 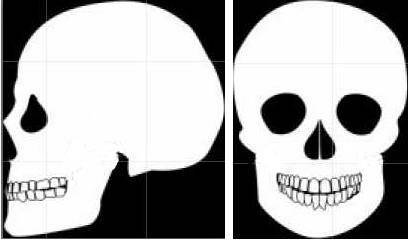 Notice the lines are more curved and closer together as the points radiate out to the edges of the skull. Pull the brow and cheek bone out one point at a time. Check the Side, Top and Orthographic views to make the points curve. Move all the teeth segments inward. Right click the Surface modifier and Collapse All. Then Convert the Editable patch, then to Editable Poly. 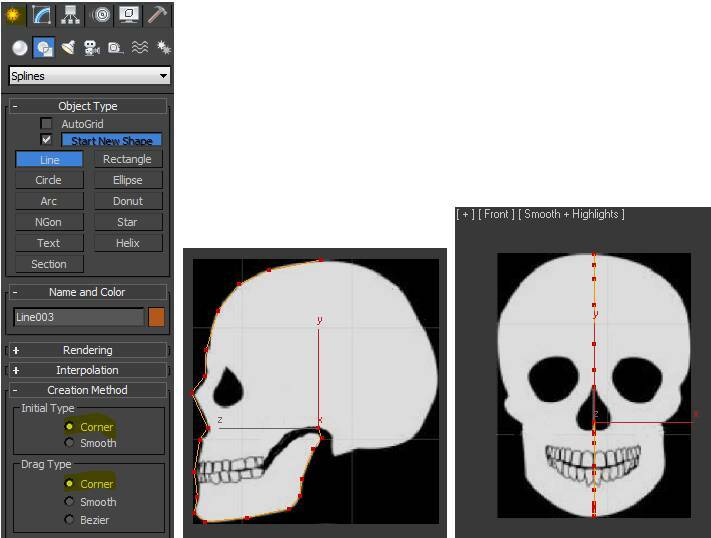 Right click the skull and go to Object Properties. Check See-Through. This will make the side background picture show through. 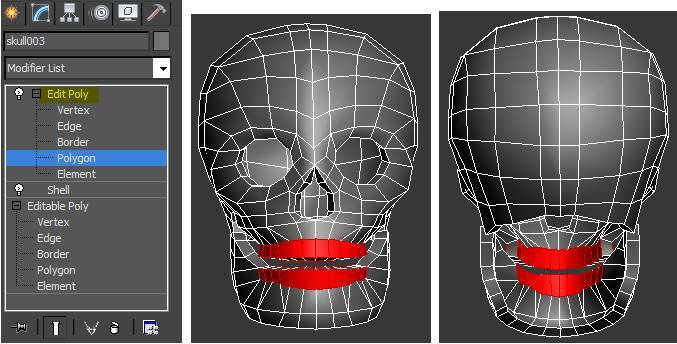 In Polygon Mode Delete the poly’s for the space in the jaw. Right click the object and Isolate. Now to use the Mirror button to create a copy of the other half of the model. Click Attach, and then click the other half. Now it is one object. Go to Vertex mode. Group select all the middle vertices. Make sure Ignore Backfacing is unchecked. Go to Weld. This will weld the vertices from the two halves, so there is one vertex instead of two for each point. Go to Polygon mode and select all the jaw poly’s. Click the Detach button under Edit Geometry. Then Detach To Element. Click the Move button on the toolbar, and pull down to separate it just a bit from the skull. Go back to Editable Poly. Add a Shell modifier. Change the Inner Amount to 0.1m. This will add inner thickness to the model. Add an Edit Poly modifier to the stack. Go to Polygon mode. Group select only the front and rear teeth poly’s. 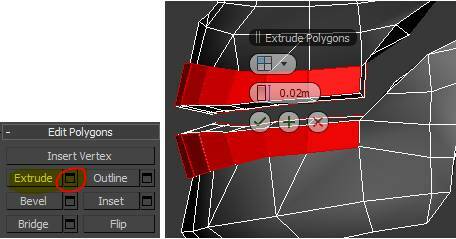 Go to the Extrude button and extrude By Polygon 0.02m. Add a TurboSmooth modifier to the stack with 3 Iterations. 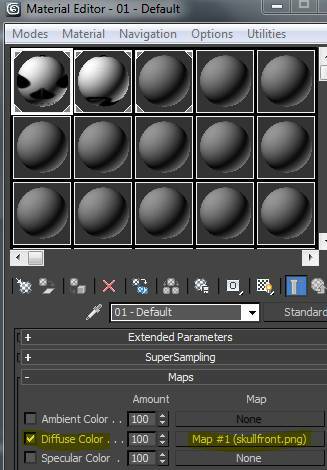 Go to the Material Editor and apply an empty material slot to the model. Change the Diffuse to white. Go to Rendering/Render on the menu. Go to The Exposure controls button. Then to Automatic Exposure Control. Background Color is white. This will give you some decent renderings. Click a viewport then Render.